China Radio International will become a part of the new Voice of China. China is creating a new giant broadcaster to ensure its voice is heard loud and clear around the world. Voice of China, as the new outlet will be known internationally, will be formed by combining three mammoth state-run national networks: China Central Television (CCTV), China National Radio and China Radio International. It will employ more than 14,000 people. The merger was revealed in a Communist Party document on a sprawling government reorganization program, championed by President Xi Jinping to reinforce the party’s absolute control in all aspects of state governance. State news agency Xinhua released the document Wednesday after it was approved by China’s rubber-stamp parliament. With echos of the Voice of America radio service created by the US government during World War II, Voice of China is tasked with “propagating the party’s theories, directions, principles and policies” as well as “telling good China stories,” according to the document. It will be under the direct control of the party’s central propaganda department. Click here to read the full article at CCN Money. This entry was posted in Broadcasters, International Broadcasting, News and tagged Cap Tux, China, China Radio International, CRI, International Broadcasting, Voice of China on March 22, 2018 by Thomas. Each morning, I enjoy listening to Radio Australia on 9,580 kHz, but I’m forced to tune elsewhere due to interference when China Radio International starts broadcasting on 9,570 kHz, via Radio Havana Cuba’s relay. 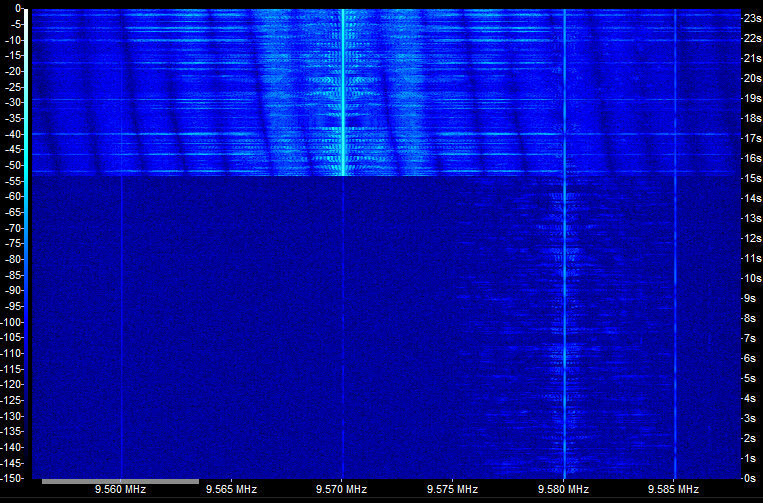 Hypothetically I should be able to mitigate any adjacent interference from CRI by listening to Radio Australia’s upper sideband. But unfortunately, RHC’s transmitters spew spurious emissions a full 20 kHz on either side of their carrier. It’s most annoying. The reason for this is clear: obviously, some of RHC’s transmitters are in need of care–and they’re not the only ones. I’ve received a number of requests from Radio Cairo to post notices about their English language broadcasts. Normally, I’m quite happy to post press releases, but in each case I’ve mentioned that their English broadcasts are almost impossible to understand. For years, RC has had a problem with AM modulation (I assume) and, to my knowledge, have never addressed it. To underscore the point, on Sunday Andrea Borgnino shared the following video/audio of Radio Cairo via Twitter. There are other broadcasters that emit messy signals, but Radio Havana Cuba and Radio Cairo are the most noticeable in my listening area. And, it seems, neither broadcaster is in any hurry to address their ongoing problems. Radio Havana Cuba, China Radio International, and Radio Cairo (among others) take note: a little care of your radio transmitters will go a long way toward increasing your listenership. What you can do: Consider contacting broadcasters when when you become aware of transmitter problems. Despite RC’s notable exception, oftentimes a broadcaster may not be fully aware of the issue––thus your feedback is necessary to help correct the problem. This entry was posted in AM, News, Recordings, Shortwave Radio and tagged China Radio International, CRI, Radio Cairo, Radio Havana Cuba, rhc on March 22, 2016 by Thomas. A state-owned radio station’s signature tune is about to be approved as China’s first sound trademark. The State Administration for Industry and Commerce (SAIC) said on Sunday that it has reviewed the application from China Radio International and plans to approve it. A sound trademark is a sound that is used to perform the trademark function of uniquely identifying the commercial origin of products or services. Famous examples include the Nokia tune and the “I’m lovin’ it” jingle of McDonald’s. China’s top legislature revised the Trademark Law to allow sound to be registered as a trademark in 2013. The SAIC had received 450 applications for sound trademarks by the end of January since starting to accept such applications in May 2014. This entry was posted in Broadcasters, International Broadcasting, News and tagged China Radio International, CRI Interval Signal, CRU, Interval Signal on February 24, 2016 by Thomas. 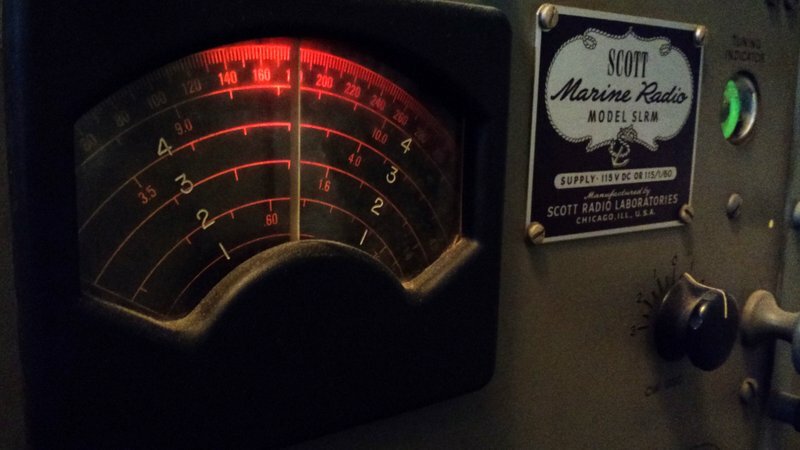 This morning, I listened to Radio Australia on 9,580 kHz with my WWII era Scott Marine Radio SLR-M (above). Radio Australia provides a reliable, strong signal into North America every morning and it’s where I typically tune for the morning news at the top of the hour. 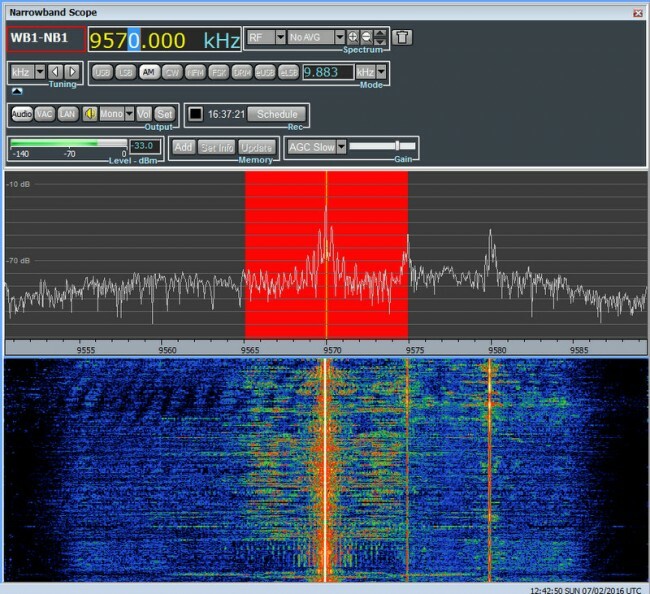 China Radio International also fires up on the adjacent frequency of 9570 kHz around 1200 UTC–their signal is also incredibly strong here as it’s relayed from Radio Havana Cuba at 250 kW. CRI’s bandwidth is almost always wider than 10 kHz–indeed, it’s often 20 kHz–which means that it completely wipes out any average adjacent signal. Indeed, when I’m testing selectivity on portable shortwave radios, I’ll often tune to Radio Australia and wait for CRI to fire up on 9570 kHz. If the portable radio can still lock onto Radio Australia after CRI is on the air–or, better yet, if an upper side band sync lock can eliminate all traces of CRI–I know the receiver has decent selectivity. This morning, when CRI began transmitting at 1200 UTC, their signal completely wiped out every trace of Radio Australia. Though the SLR-M’s narrow AM filter is still quite wide, it can typically cope with the adjacent CRI carrier. 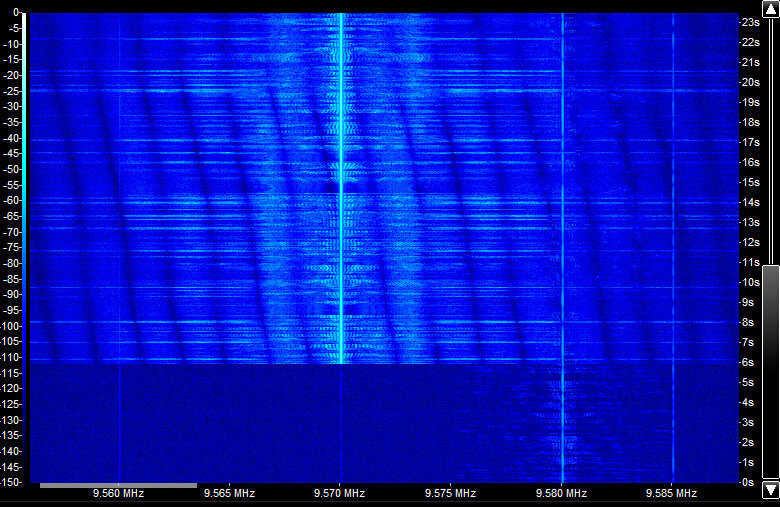 CRI’s AM bandwidth was 30+ kHz wide! In my book, that was an abusive use of the band. This was, by no means, an isolated event. It was just particularly annoying for me this morning as I was enjoying a good cup of coffee and the morning ABC news. I’ll send a message to CRI and RHC about this, but I have my doubts anyone will take action. This entry was posted in Broadcasters, News, Shortwave Radio and tagged Bandwidth, China Radio International, CRI, Radio Havana Cuba, rhc, Shortwave Bandwidth on February 7, 2016 by Thomas. The Federal Communications Commission and the Justice Department are investigating a California firm whose U.S. radio broadcasts are backed by a subsidiary of the Chinese government, officials said. “Based on reports, the FCC will initiate an inquiry into the facts surrounding the foreign ownership issues raised in the stories, including whether the Commission’s statutory foreign ownership rules have been violated,” FCC spokesman Neil Grace said. The California firm is owned by James Su, a naturalized U.S. citizen born in Shanghai. Reuters reported Monday that Su’s company, G&E Studio Inc, is 60 percent owned by a subsidiary of Chinese state-run radio broadcaster China Radio International (CRI). The FCC doesn’t restrict content on U.S. radio stations, except for rules covering indecency, political advertising and children’s programming. But under U.S. law, the FCC prohibits foreign governments or their representatives from holding a radio license for a U.S. broadcast station. Foreign individuals, governments and corporations are permitted to hold up to 20 percent ownership directly in a station and up to 25 percent in the U.S. parent corporation of a station. G&E does not own any U.S. stations, but it leases two 50,000-watt stations: WCRW in Washington for more than $720,000 a year, and WNWR in Philadelphia for more than $600,000 a year. Through a different set of limited liability companies, Su owns, co-owns or leases virtually all the air time on at least a dozen other U.S. stations. Those stations carry G&E content, which is produced largely by his West Covina, California studios or by state-run CRI in Beijing…. This entry was posted in Articles, Broadcasters, International Broadcasting, News, Propaganda and tagged China Radio International, CRI, Propaganda, Reuters on November 3, 2015 by Thomas.